Deaerators are typically elevated in boiler rooms to help create head pressure on pumps located lower. This allows hotter water to be pumped without vapor locking should some steam get into the pump. Makeup water introduces appreciable amounts of oxygen into the system. 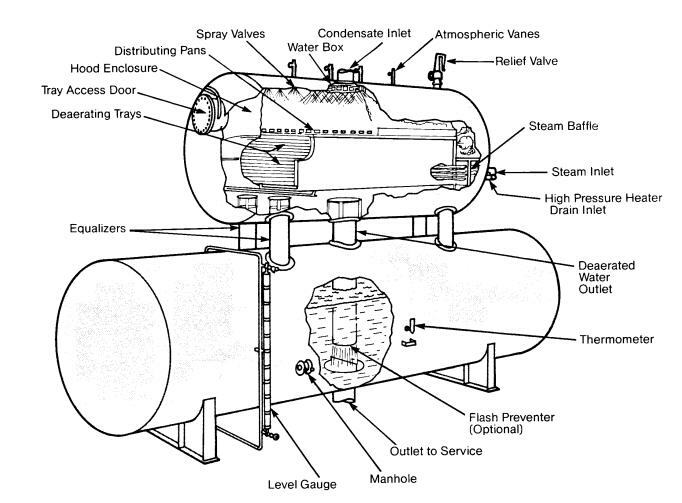 Oxygen can also enter the feed water system from the condensate return system. Possible return line sources are direct air-leakage on the suction side of pumps, systems under vacuum, the breathing action of closed condensate receiving tanks, open condensate receiving tanks and leakage of non-deaerated water used for condensate pump seal and/or quench water. With all of these sources, good housekeeping is an essential part of the preventive program. Because dissolved oxygen is a constant threat to boiler tube integrity, this discussion on the deaerator will be aimed at reducing the oxygen content of the feed water. 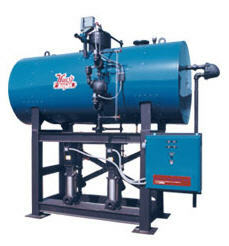 The two major types of deaerators are the tray type and the spray type. In both cases, the major portion of gas removal is accomplished by spraying cold makeup water into a steam environment. Complete oxygen removal cannot be attained by mechanical deaeration alone. Equipment manufacturers state that a properly operated deaerating heater can mechanically reduce the dissolved oxygen concentrations in the feed water to 0.005 cc per liter (7 ppb) and 0 free carbon dioxide. Typically, plant oxygen levels vary from 3 to 50 ppb. Traces of dissolved oxygen remaining in the feed water can then be chemically removed with the oxygen scavenger. 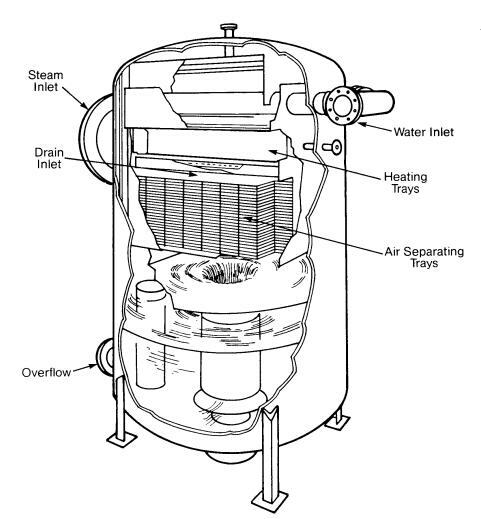 Oxygen scavengers are added to the boiler water, preferably in the storage tank of the deaerator so the scavenger will have the maximum time to react with the residual oxygen. Under certain conditions, such as when boiler feedwater is used for attemperation to lower steam temperature, other locations are preferable. The most commonly used oxygen scavenger is sodium sulfite. It is inexpensive, very effective and rapidly reacts with the trace amounts of oxygen. It is also easily measured in boiler water. In most cases it is the oxygen scavenger of choice. There are instances in some higher pressure boilers (generally above 900 psig), that some of the sulfite may decompose and enter the steam, causing problems in the condensate systems and condensing steam turbines. In these cases, substitute (usually organic-based) oxygen scavengers can be used. New oxygen scavengers have been introduced in recent years. The decision to use them or rely on sodium sulfite should only be made by those qualified to make boiler water treatment decisions. In all cases the new product should be carefully added and its effectiveness evaluated in accordance with operating procedures. Common phosphate compounds added to treat boiler water include sodium phosphate (monosodium phosphate, disodium phosphate or trisodium phosphate) or sodium polyphosphate. They all function approximately the same; the choice of which to use depends on the quality of the boiler water and the handling requirements of the user. AmpuImetric – This test offers ease of operation and minimum time in collecting reliable data. Capsules are available in the 0-100 ppb and 0-1 ppm range. Oxygen Analyzers – Offers accurate reliable direct measurement in liquid streams. Used to monitor dissolved oxygen continuously or intermittently at various points in the condensate and feedwater systems. Basically there are two general techniques for measuring Dissolved Oxygen (DO). Each employs an electrode system in which the dissolved oxygen reacts at the cathode producing a measurable electrochemical effect. The effect may be galvanic, polarographic or potentiometric. One technique uses a Clark-type cell which is merely an electrode system separated from the sample stream by a semi-permeable membrane. This membrane permits the oxygen dissolved in the sample to pass through it to the electrode system while preventing liquids and ionic species from doing so. The cathode is a hydrogen electrode and carries a negative applied potential with respect to the anode. Electrolyte surrounds the electrode pair and is contained by the membrane. In the absence of a reactant, the cathode becomes polarized with hydrogen and resistance to current flow becomes infinite. When a reactant, such as oxygen that has passed through the membrane is present, the cathode is depolarized and electrons are consumed. The anode of the electrode pair must react with the product of the depolarization reaction with a corresponding release of electrons. As a result, the electrode pair permits current to flow in direct proportion to the amount of oxygen or reactant entering the system; hence, the magnitude of the current gives us a direct measure of the amount of oxygen entering the system. The second basic measuring technique uses an electrode system that consists of a reference electrode and a thallium measuring electrode. No semi-permeable membrane is used; the electrode system is immersed directly into the sample. Oxygen concentration is determined by measuring the voltage potential developed, in relation to the reference electrode, when dissolved oxygen comes in contact with the thallium electrode. At the surface of the electrode the thallous-ion concentration is proportional to the dissolved oxygen. The voltage potential developed by the cell is dependent upon the thallous-ion concentration in this layer and varies as the dissolved oxygen concentration changes. The cell output rises 59 millivolts for each decade rise in oxygen concentration. This technique uses a potentiometric system. The method measures directly the concentration of oxygen in the sample. As in the first technique, temperature compensation is a must and is achieved in about the same way. In both techniques, interfacial dynamics at the probe-sample interface are a factor in the probe response. A significant amount of interfacial turbulence is necessary and for precision performance, turbulence should be constant.